Home / blog / Workspace Flicker in IE 11? 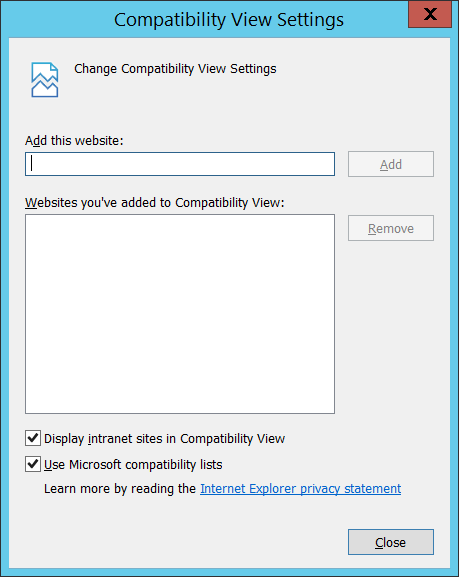 Try Compatibility View! I have a new VM with blackpearl 4.6.9 and Internet Explorer (IE) 11 loaded on it. I’ve never been able to get the built-in reports inside K2 Workspace to display correctly — if they’d display at all, it’d just be for a quick moment — like a flicker — and then, nothing. I was assuming the issue was something with the display resolution inside the VM. But this morning I got a tip from a coworker that proved otherwise. He told me that IE 11 has a known “flickering” issue. His recommendation — which worked like a charm — was to add the domain to the browser’s Compatibility View Settings list. Open IE 11 and go to your K2 Workspace. Click on Process Overview to observe the default state — if your display was like mine, you’ll pretty much see a blank white screen. Now for the fix: go to Tools (in the upper right corner of the browser; the gear icon) and select Compatibility View Settings. 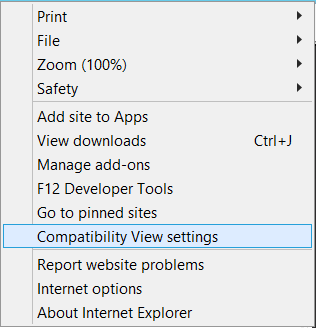 In the Compatibility View Settings dialog, add your workspace to the list of sites. IE 11 should refresh, and your Process Overview report should now be visible!